Whispers and giggles fill the air as Roberta Guaspari coaches her students. “Stop plucking your violins! One more time and then it’s for real!” The commitment she demands from her students reflects the seriousness of her desire to establish a first-class violin program in the East Harlem public schools of New York City. Roberta grew up in a working-class family in Rome, New York. When her father, a factory worker, was killed in an industrial accident, her mother raised the family alone, instilling the importance of a good public school education. “I would have never had violin lessons if it had not been for public schools,” Roberta says. She earned music and music education degrees from the State University of New York at Fredonia and Boston University. In 1980, Roberta moved to New York City as a single mother with her two sons, Nick and Alexi. For the next eleven years, Roberta taught violin classes in three East Harlem schools. Her violin program provided a creative outlet for kids who would not otherwise have been exposed to such opportunities. Roberta’s teaching position was abruptly eliminated, due to budget cuts, in 1991. With the support of her students’ parents and school administrators, Roberta responded by creating a non-profit foundation, the Opus 118 Music Center, Inc., to enable her to continue to teach in East Harlem. She solicited artists and musicians to pay for expenses and her salary. After a series of prominent press accounts about her program, she received the help she needed. On Mother’s Day, 1991, the violinist Itzhak Perlman called: “I just saw your kids on TV, and they sound wonderful. What can I do to help?” Roberta asked him to come to their June concert. “Roberta is not teaching children how to play the violin,” he told the crowd. “She’s teaching them how to be doctors and lawyers and how to have dreams.” Opus 118 met its fundraising goal and paid for enough equipment for each of her students. The East Harlem Violin Program provides violin instruction to 165 students between the ages of five and twelve. “It’s difficult to work at three different schools, to carry music for all three schools, repair numerous broken violins, and pick up parking tickets wherever I go.” Roberta explains. Students in the violin program are chosen by lottery. Three-quarters are black and Latino students. Most cannot afford violin lessons or their own violin. With the help of Opus 118, Roberta’s students are provided with violins as long as they make the commitment to try their hardest. In the hands of the young East Harlem students, Bach and Mozart are more than magical. Since 1992, Roberta’s violin students have played at the White House, Carnegie Hall, Yankee Stadium, Madison Square Garden, and on radio and television shows. 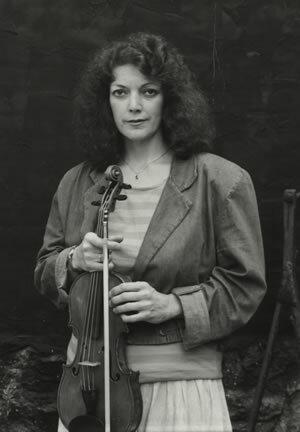 In 1993, a group of world-famous violinists, including Isaac Stern, Itzhak Perlman, Arnold Steinhardt, and Midori, performed with Roberta and her students on stage at Carnegie Hall in a “Fiddlefest” benefit.